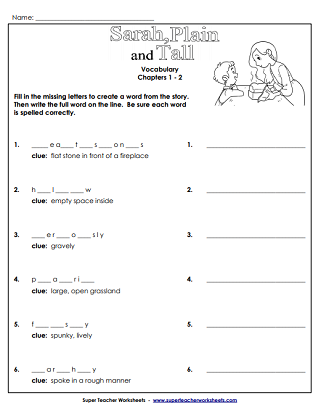 This page has a printable literature unit to use with the short novel, Sarah Plain and Tall by Patricia MacLachlan. 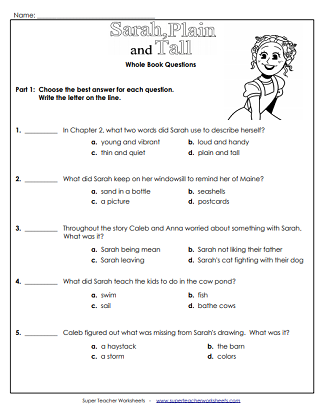 It includes reading comprehension worksheets, literature circle printables, writing prompts, and puzzles. 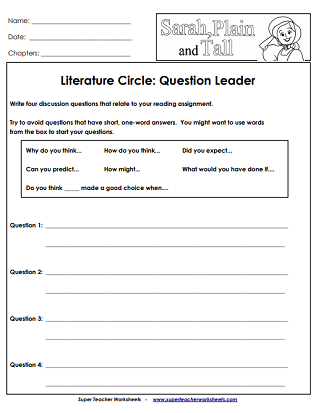 The questions for these chapters will help the reader establish the necessary background knowledge to fully understand story. Fill in the missing letters to create a word from the story. Then write the full word on the line. Vocabulary words include prairie, fiesty, harshly, and hearthstones. This printable has six vocabulary word cards and 6 definition cards to review for chapters 1-2. Sarah has arrived. Read Chapters 3 and 4 then answer this mix of multiple choice and short answer questions. Read each sentence. Look up the definition of the underlined words in the dictionary. Write each definition on the lines provided. Words include clattered, suspenders, and rustle. These vocabulary cards for chapters 3 and 4 have definitions for the words: bloomed, alarmed, clattered, suspenders, and rustle. Sarah is adjusting to life on the farm, and the children are liking Sarah living with them. Chapters 5 and 6 focus on Sarah and daily life on the prairie. Match each vocabulary word from the story to the correct definition. Words include petticoat, gleamed, meadow, and gullies. Print and cut out these vocabulary cards to review the highlighted words from chapters 5 and 6 from the book, Sarah, Plain and Tall. The picture shows a scene from Chapter 5 of the book. Write a few sentences to tell who is in the picture and what is happening. This mix of multiple choice and short answer questions touch on the main ideas in Chapters 7 and 8. Choose the correct definition for each underlined vocabulary word. Words include pungent, squall, eerie, and trembling. The vocabulary words from chapters 7 and 8 include: squall, eerie, pungent, shuffling, herded, and trembling. Practice reading the words and learning the definitions for each. In the final chapter of the book the reader learns if Sarah will stay or leave the Witting family. After reading Chapter 9, answer the questions on this sheet. Match each vocabulary word from the story to the correct definition. Write the letter on the line provided. Words include sly, scuttling, squinted, and pesky. Print and cut out these 18 vocabulary cards to practice the words from chapter 9. If you want to reuse the cards, try laminating them. Test your understanding of the text by completing this 15 question activitiy that asks assesses your knowledge about the entire book. Throughout the book there are many comparisons of life on the prairie to life in Maine. Use this graphic organizer to compare and contrast the two environments. This PDF has four SP&T bookmarks that you can give to students to use while reading the story. Print or copy this file on heavy card stock. We have literacy units for dozens of titles, including Bunnicula, Tales of a Fourth Grade Nothing, Stone Fox, Magic Tree House, Frindle, The Boxcar Children, and many more.